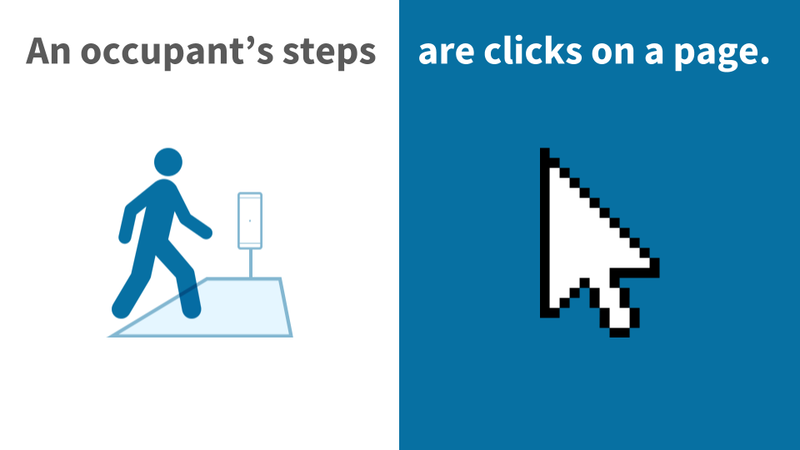 Can you measure real-world behaviour using tools designed for the web? Google Analytics for the real world. Several companies have self-identified as such. We ourselves have written a blog post entitled Google Analytics for the Physical World. But what happens when you literally run real-world behaviour data through tools designed for the web? The above screenshot shows what happens when we do exactly that, using Notman House in our native Montréal as the test subject. The dashboard (shared here) was created using Google Data Studio based on data from Google Analytics (GA), industry-standard tools for measuring behaviour on the web. The source data, however, has nothing to do with the web. Since 2012, we’ve had our infrastructure deployed at Notman House. Each of the orange dots in the above image represents one of our sensors: there are three on each floor, plus one in the café (not shown). These ten sensors detect, among other things, the Bluetooth signals of smartphones and wearables carried by the occupants of the house. Our Pareto SaaS relays this real-time location data to GA. In web parlance, we’ve modelled Notman House as ten web pages with users being not the humans themselves, but rather their Bluetooth-emitting smartphones and wearables. An obvious shortcoming is the fact that many people keep Bluetooth disabled on their phone, while conversely, an increasing number of people are carrying multiple Bluetooth devices: uniquely counting each human is impractical. But when you’re capturing 1000+ daily sessions, the trends certainly pervade as we’ll now show! The daily occupancy cycle of Notman House is consistent week over week (dark blue vs. light blue bars), and concentrated between the hours of 8am and 7pm (graph is GMT, hence shifted 5 hours from local time), both of which agree with observation. User sessions were far more likely to include the Café and the 3rd Floor West, which is consistent with observation as both are event spaces which routinely attract the most occupants. Similar to how web analytics can be split into desktop/tablet/mobile and browser type, Bluetooth packets often include information about the device type or brand (see Sniffypedia) which may be correlated with user demographics. Indeed we’ve observed seemingly characteristic device distributions based on region and venue (ex: office/store/school). 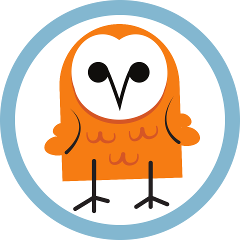 Can you measure real-world behaviour using tools designed for the web? With little effort, using only the basic functionality of GA, we were able to extract the three highlighted metrics, each of which effectively captures the behaviour of occupants of physical spaces. Imagine the potential when leveraging the extensive functionality of tools such as GA. Imagine as a retailer creating a Data Studio dashboard which compares e-commerce and in-store behaviour side-by-side. Now imagine the additional granularity and insights when both people and assets are individually identifiable by opting-in with a mobile app or carrying an inexpensive Bluetooth beacon. Time and again the web has shown that those who measure outperform. Not only can you measure real-world behaviour using the tools of the web, history suggests that, sooner than later, you definitely should! Author jeffPosted on 24 06 17 25 06 17 Categories bloggyActiveTags bluetooth, google analytics, location analytics, Notman House2 Comments on Can you measure real-world behaviour using tools designed for the web? Imagine you could “hear” Bluetooth devices moving through a building. In anticipation of last weekend’s #HackTheHouse hackathon for smart buildings, hosted at Notman House where we’ve had our technology deployed since 2012, we created the Notman Tonal Presence web application to do just that. On each of Notman’s three floors, there are three of our Bluetooth Low Energy (BLE) sensors (which we call reelceivers), plus an addition sensor in the adjacent OSMO Cafe. Think of each floor as a musical note in a scale (C – E – G – C), and each wing of that floor as a pan in stereo (Left – Centre – Right). When BLE devices “appear” and “disappear” they produce a note which encodes the location by the tonality and pan. Same thing when BLE devices “displace” from one zone to another, only these use a ping-pong delay rather than a pan. Yes, they’re on the second floor east (right) wing. Why so noisy? As we discussed in our ObservaBLE Etiquette blog post, the Estimote Nearables cycle their identifier with every transmission. To an observer, that would be interpreted as a new device “appearing” each time. Hence plenty of appearance and disappearance notes in the web application. 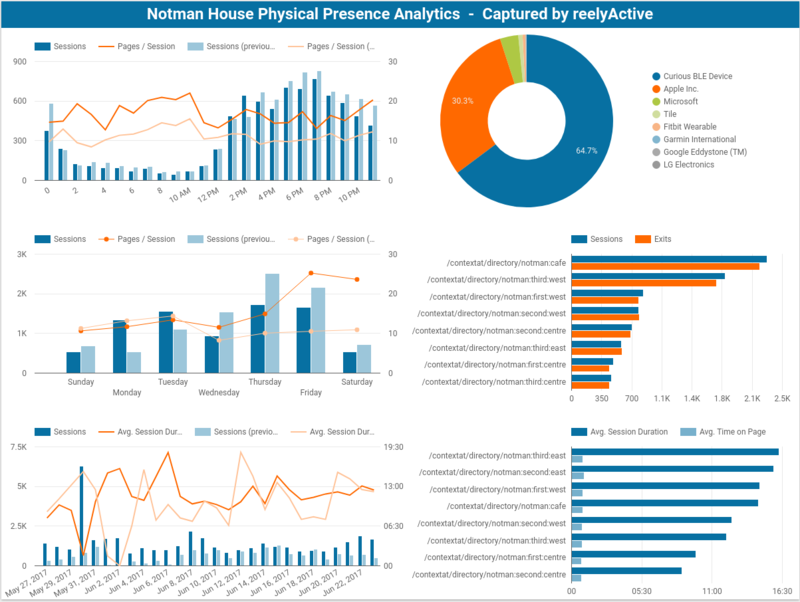 To reinforce this point, have a look at the Google Analytics (GA) timeline for Notman House. Our platform pushes all the events from the house to GA (see our Google Analytics for the Physical World blog post), where each is interpreted as a session based on its identifier. The Nearables’ aggressive identifier-cycling results significantly biases the number of sessions, and hence we can tell from the edge of the high plateau when they arrived: shortly after 16h on November 15th. We created the Notman Tonal Presence application as an example of calm technology for smart buildings. The ambient sounds allow the listener to subconsciously register foot traffic within the building while leaving their attention free for other tasks. Even the casual listener would have been gently alerted to the arrival of the Nearables, which is precisely the objective of calm technology. And, now, duly alerted, we can direct our attention towards filtering out the Nearables from GA so that their incessant identifier-cycling doesn’t saturate the session counts!